An enlightening depiction of the resilience of the human spirit “to recover from or adjust easily to change or misfortune. Dramatic personal experiences that deal with *fear *the force of words *being stuck in the past *the negative affect of making promises *the adult reality of childhood pain *forgiving one’s past *destiny and purpose, and other insights gained from lessons learned. Three “time efficient” uses for promoting self-awareness and self-discovery. PHILOSOPHY IS A FUNDAMENTAL BELIEF IN SOMETHING. 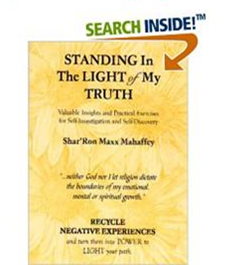 The essays in “Standing In The Light of My Truth” demonstrate the author’s “fundamental belief” that the human spirit is resilient—that is, capable of withstanding whatever traumatic event that comes one’s way without any harm to one’s spirit self. The essays underscore the author’s philosophy that, because one is human and spirit, one has a natural inclination (often intense) to recover from or adjust easily to change or misfortune. The essays and exercises are practical as opposed to idealistic, and integrate philosophy with methods and practices that promote self-awareness and self-discovery. They deal with overcoming difficulties and limitations, living without holding on to anger and fear, investigating one's relationship with one's self, recycling negative experiences, and how God reveals Himself in one's life even if one doesn't worship Him in a church or mosque, synagogue or temple or whether one consider one's views religious. The exercises are designed to help one present an authentic reflection of one's inner self in one's exterior life. In Chapter 17, the author used parts of her compelling life story as a testament of how God s grace helped her overcome the physical and psychological abuse inflicted on her by her stepmother despite the church and those in her little hometown who ignored the abuse. The author concludes that all of her experiences, the good as well as the demoralizing and painful ones helped form the basis for what she believes about God, life, human nature, relationships, and love.